Right from the get go, this summer presented its challenges. I say challenges because I like to think that I can rise to them, rather than being overcome by them. So, when my 85 year old mother experienced a series of unfortunate events (think Alexander and the Terrible, Horrible, No Good, Very Bad Day), it was time to put my thinking cap on. She was beset by one malady after another and while helping her through, I knew that I needed to re-craft my art practice. This is because art is both a vocation and something that’s hard to go without. I had to create a series that was a marriage of necessity and curiosity. And my topic? Over the last few years, I’d noticed that the recycled copy papers I use to mop up extra paint produced some extraordinary layers. The effect is something like a stucco wall with many layers of paint; an inadvertent fresco. But how to create that effect on the thicker art paper? I began by simply putting pieces of paper down on the painted plate and leaving them there for a time. In this hot, dry valley, I didn’t need to wait overnight. Several hours could produce a paper with a thick layer of acrylic, very satisfying to pull off the gelli plate. I also added one or two layers of gel medium, tinted to bring out the color I was working with. It’s been tremendous fun and the smaller sheets of paper provided a journal format; a way that I could record the mood of the day, the season and my own internal drive to leave traces of these days. I've been tucked into my studio for the last couple months, drawing jade plants, diverse succulents, taking notes and obsessively printing gelli prints. I’ve filled a notebook, and in the process, found a rhythm and perhaps some answers to a problem I've been trying to solve. For the past couple of years, I've worked on a series called Shift, in which I explored my ecological niche of Davis. As the series progressed, I became more interested in the unusual shapes of plants I found visiting various botanical gardens. 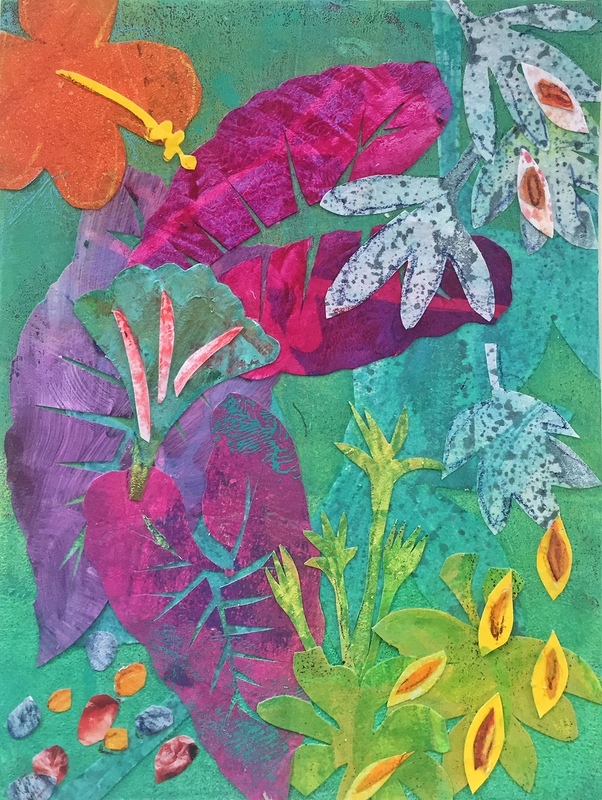 I began another series of collage works I called Botanical Dreams, inspired by the 30 paintings in 30 days challenge presented by Leslie Saeta. I’ve wanted to continue this series and I wanted to wed the monoprints of Shift with the collage, but after several months of trials and lots of recycled prints, I think I’m trying to make an arranged marriage. Shift needs to be one series and Botanical Dreams another. As I write this, I realize that actually, I'm the bridge. I think that it's hard to leave the safety of a known series and decamp to another largely unknown territory, but the connection lies simply in my own two hands. Poppies, Lupines and Printmaking Too! Many years ago in graduate school, I was introduced to a form of printmaking called monoprinting, or sometimes, monotype. I'm a person not well suited to the long and meticulous craft of printmaking. But I did so love the notion of placing paper onto plate, applying pressure and seeing the creation of a whole new piece. It appeals to the alchemist in me. Through the years I've experimented with different kinds of plates: glass, plexiglass, even the plastic surfaces of cutting boards, but I couldn't find a decent, printable surface that worked without the aid of a press. Then, one day several years ago, I visited an open studio event of a friend. She gave me a tour, and there, in one of the other artist's spaces, it's colorful package glinting in the sun, was a gelli plate. As I touched its soft yielding surface (much like a batch of jello), I considered the possibilities. My friend offered to show me how it worked and we had several weekend workshops including other interested artists. I was hooked. Now several years and a number of plates later, I'm still experimenting, trying to push the limits of what the plate can do. 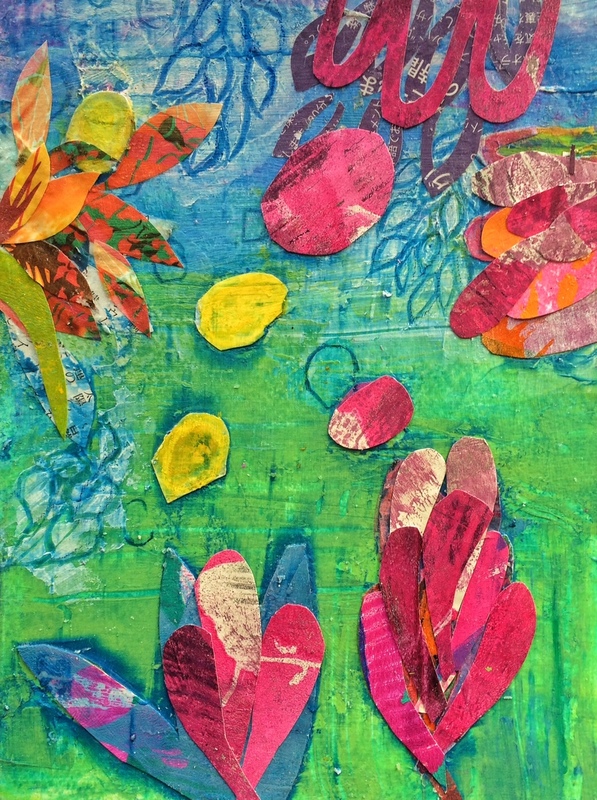 Next month, I'll be teaching a gelli printing workshop at our local Pence Gallery: Saturday, May 14 from 10- 3. There are still a few spots left, so whether you're new to gelli printing, or you'd like to stretch your printmaking boundaries, I'd love to have you. I'm super excited about the planning--and look forward to sharing what I've learned about the simple beauty of this process. I decided to piece out all the steps (that I could think of) that are included in creating art work for an exhibit. Step one, a sine qua none; Inspiration. Most of the inspiration for the Bloom 2 exhibit at the Pence came from visits to the San Francisco Botanical Gardens. Step 2, Experiments. When I started making the prints, eager to see how they might look together, there were lots of false starts. Step 3, Hmm. Prints that were good in themselves, but didn't quite fit into the 9 piece format I wanted. Step 4, Coalescence. After a couple of months and lots of future collage fodder, I saw possibilities. When this happens, I've reached a certain way of seeing, and mostly, thrown caution to the winds. Solutions come spontaneously, rather than through a forced march. Step 5, Documentation and Photographs. If you take good ones yourself, wonderful. I found a most excellent photographer in the artist, Diana Jahns. She finds the best angles, the best light and works until she gets what I want (as well as many options I never considered). Step 6, Framing. Am I going to do it myself with pre-made frames or pay to have them housed in a nice shadow boxes with precise measurements? What's my investment as a whole? I opted for a framer and they turned out wonderfully. Step 7. Getting the word out; time to hit social media. Step 8, Delivery! (and Deliverance). Bloom 2 Opening this Friday! Bloom 2 is up and 2nd Friday is around the corner! With an abundance of gallery spots in Davis, there's something for everyone to see. Of course, I'd love to see you at the Pence, where we'll be celebrating the Bloom 2 show. I'll have several of my multiple monoprint works on display including Folia, pictured here. Come and enjoy a glass of wine, some fresh art chat and lots of gorgeous art for sale! In March I'll begin a new job at Wellness Within, an amazing organization that provides support to cancer patients, survivors, their families and caregivers, all at no cost. They offer programs in expressive arts, yoga, meditation and mindfulness. I feel very lucky to be a part of the program. As I worked on designing a class, I came up with the idea of an art circle. I think of it like a living mandala; a gathering of people exploring the healing powers of art making. Creating art in a community setting is a gentle way of bringing all of us, facilitator (me) and group members alike, back to our essential, inner selves. We'll be using a variety of media; collage, visual journaling, creation of personal mandalas and a wonderful directive that was created by art therapist, Gretchen Miller; Creative Covenants. Don't let this list scare you though.You do NOT need any prior art experience. The only requirement for our time together is the ability to wield a glue stick and use a pair of scissors. If any of you reading this knows anyone with a cancer diagnosis, cancer survivors or their families and caregivers in the Sacramento area, who might benefit from this group, please have them contact Wellness Within. If you’d like to learn more about this workshop, you can email me at hkhunterarts@gmail.com. I’d love to have you join us! ...healing is more than just my medical team addressing a disease. Sometimes, a project ends with fireworks and celebration, sometimes with the feeling of quiet satisfaction of a challenge met and completed. In the case of 30x30, I found the latter but also, the opening to a new series of work. 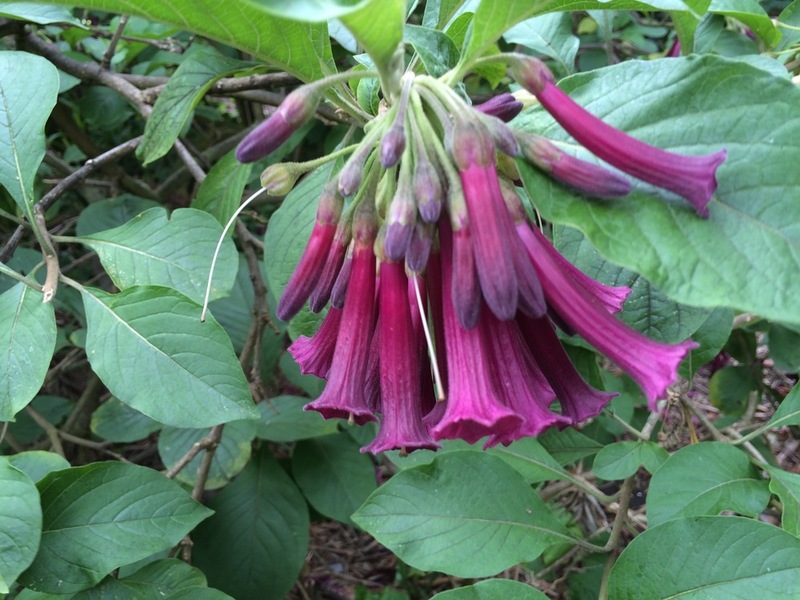 In Kauai, I was captivated by the foliage and flowers; the variety of colors and the fantastical shapes of the leaves. One day, riding down to the beach, I twisted my head around to stare at a tree whose branches and needle patterns wound around in an elegant spiral. I made the decision to return to the island this fall for an artist's retreat; a time to study, paint and draw the plant life. Until then, I think I'll be spending a lot of time at our local botanical garden, haunting my favorite, the Australian section, the closest cousins we have to tropical plants. Below you'll find a convening of the 30 days--I was excited to make them into one giant collage; a celebration of the challenge. I got busy over the weekend with an art therapy project for Wellness Within. They are a wonderful organization in Roseville, CA that works with cancer patients, survivors, their families and caregivers. It's a new job for me and I wanted to do my best for the workshop, so I put the 30x30 on the backburner for that time and let it simmer. In order to catch up and cover the three days, I laid out the ground papers and worked on all three simultaneously. It was fun and gave me some ideas about how to expand aspects of this series into larger pieces. Tu BiShvat Seder, or the New Year of the Trees is a Jewish holiday that takes place each year at the end of January or beginning of February. There are many different explanations for the holiday, but I'm most fond of the one that expresses gratitude for the quickening of life within the trees, or, in other words, the first invisible signs of spring. Although it is gray and rainy outside, warm inside my studio, I think of the Dylan Thomas' poem: The force that through the green fuse drives the flower. #22 celebrates the greening of life, becoming juicy and ready to bloom whatever our age. While I'm no longer sitting in front of a spectacular view of mountains and sea, I'm very happy to be back in my own studio with all the quirky accoutrements that make it mine. I'm amazed that it's day 21 of this challenge and I feel in many ways as if I've just begun. There's a suitcase to be unpacked and memories to be stored in my minds' eye, but the studio calls. #20 is an homage to the water, the trees and the vivid blooms of the islands. Day #17, 30x30, Dreaming Again! As the challenge continues, I find myself drawn more and more into the multitudinous shapes of the leaves on this island of Kauai. So many of them are palmate, meaning like a hand, and they come in all sizes from half an inch to several feet long. I could spend a long time here, drawing them. Much quieter here in our Hawaiian hale this afternoon. None of yesterday's drama. Just a quiet appreciation for the view from here. Day #15, 30x30, Talk about blessings! I'm straying again from my theme of Botanical Dreams, for good reason. This morning our family traveled to one of our favorite beaches to explore. I stopped in front of the crashing waves and offered a short prayer for the day: for protection, for grace and for generosity and walked off towards the lava rocks. I stopped to put on my Keens, knowing the danger of lava cuts. As I bent to pull on my sandal, a man appeared and began to warn us of the 40 foot waves. My mind took in the information, but as it did, a huge wave flipped me over and dragged me out. There was nothing I could do, but shout for help. My sister and the gentleman had to wait for the water to go out before they could reach down and pull me to safety. My next thought was for my daughter and her boyfriend who had gone on ahead. I asked the man, who appeared ocean savvy, to go with my husband and find them. Which they did. But the story wasn't over. My leg was fairly cut up from the lava and my husband also scraped his foot, trying to help. We stopped at a local store for band-aids and Neosporin. My sister, who was still in shock from the incident (as was I) ran in without her wallet. When she got to the cash register, she discovered she'd forgotten her wallet. Another protector emerged in the Australian woman behind her in line, who simply said; "I'll get it." Amy promised to pay it forward. After two such incidents of grace what can one do but be thankful? After a day trip to the south shore of Kauai to visit family (and a delicious meal from my chef cousin), I decided it was time to keep it simple on the 30x30 challenge. A night of aloha can mean a morning of, well, you know! Sometime during the evening, my cousin Mike mentioned that on a clear day, he could see to Oahu. His remark stuck in my mind and manifested in these sailboats that I remember from the Honolulu harbor. I took a break from 30x30 over the weekend to begin my Yoga Teacher Training program at Kaya Yoga in Davis. Not making a collage Saturday and Sunday felt like trying to keep my hand out of the proverbial cookie jar. And then, flying to Kauai on Monday, well how can you argue with that? Now, settled in our home away from home, the colors of #12 surround me. Day #8, 30x30, Here comes the sun! It's all about the weather here as Beatles lyrics run through my mind in a crazy counterpoint. "Here comes the sun...and I say, it's alright" is swiftly followed by "Rain, I don't mind. Shine, the weather is fine." * The weather in our Central Valley is equally capricious. Moments of sparkling azure skies cloud over quickly with a gray mist promising rain. It all comes out in the art. *Partial lyrics from the songs "Here Comes the Sun," and "Rain" by the Beatles. Day 7, 30x30, the challenge continues! The first few days of a challenge are exhilarating. Pictures emerge, I try out different techniques and there is a splendid newness. The real work begins when the shine wears off. Fortunately, there are also dreams. 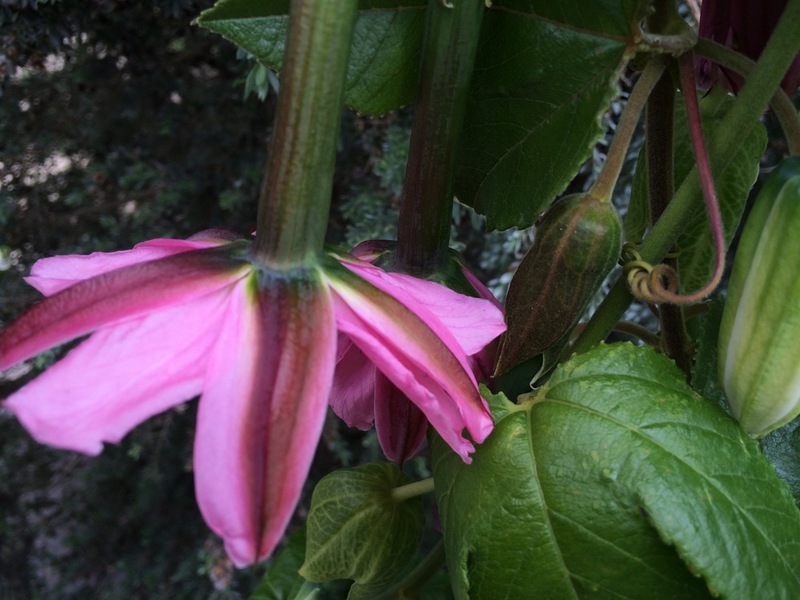 All last night as I alternately slept and woke, the outlines of leaves and flowers arose before my eyes. I recognized this as the blessing it was, grabbed a pencil and paper and began drawing. Day 6, 30x30, the storm is here! Last night, as I lay in bed, wind lashed at the trees, and sheets of rain streamed down the windows. "California dreaming indeed!," I thought. And as I thought about "Day 6," and what kind of background I might use, I imagined using my gelli plate to print paper with gray droplets and layer the plant forms on top of that. Gray droplets however, soon shifted to aqua skies and a strange amalgam of a lauhala tree* emerged. Keep the rain coming--I'll create the blue skies in my studio! *The lauhala tree is native to Hawaii.